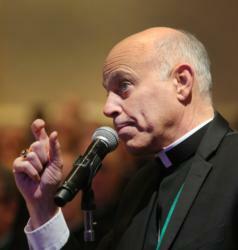 SAN FRANCISCO (CNS) — Much of the devastation of American social life is the result of “our society’s crimes of sacrificing our children” through abortion, Archbishop Salvatore J. Cordileone of San Francisco said in a homily at a Mass for 40 Days for Life. The archbishop celebrated the special pro-life Mass at St. Anthony of Padua in San Francisco March 23 before taking part in a quiet half-mile prayer procession to the nearby Planned Parenthood center. While the archbishop has participated every year in the 40 Days campaign, the Mission District Mass and procession marked a new level of support by the archdiocese. Valerie Schmalz, the director of the archdiocesan Office of Human Life & Dignity, which organized the event, told Catholic San Francisco, the archdiocesan newspaper, that the Mass and prayer procession were “a way to formalize archdiocesan support for 40 Days for Life,” which is a national prayer and advocacy campaign. “Prayer does help change hearts and save women and their unborn children from abortion. With the Mass and rosary procession to Planned Parenthood, we lifted our prayers to help all those involved in this terrible industry but especially for the women contemplating abortion that day,” she said. In his homily, titled “Asking God for Mercy, in Order to Overcome the Power of Evil in the World,” the archbishop connected the Israelites’ adoption of pagan idols and child sacrifice to the contemporary prevalence of abortion. “Don’t we see this happening in our own time? The innocent being offered up in sacrifice, but not to pagan gods, the idols of Canaan, but to the idols of selfishness, greed, lust; to the idol of reducing others to an object in order to be a means to one’s own end,” he said. “Let us come to our senses to realize that God is ready to forgive us,” he said.